different. 'different' - a Johnny Depp wallpaper created by TheCountess using parts of a quote by him. 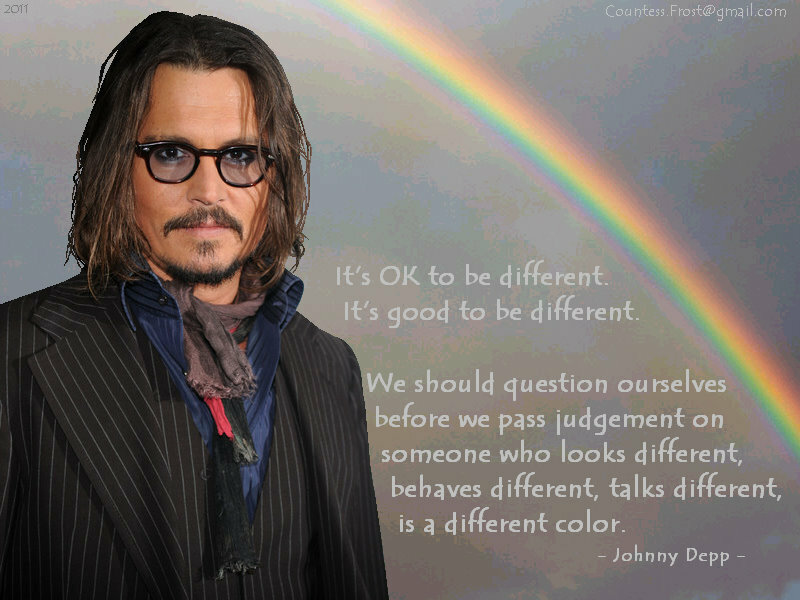 HD Wallpaper and background images in the Advice club tagged: johnny depp actor musician director johnny depp quote fan art wallpaper thecountess. What are we without people being there for us? watchin him now. One amazing, hot man. Put those binoculars down! lol! Johnny Depp is gay?! WTF!?! Who said anything about being gay, swiddlewiddle? Even if he was, I wouldn't like him any less. I think what he's trying to say is, it's OK to be yourself. You don't have to fit into some kind of mold of what a lot of people consider to be normal. Being gay is not the only kind of different in this world. We're all different in some way or another, and that's just part of what makes each and every person special.